Excellent! The only thing missing was crab claw crackers. We caught crabs every day and feasted every evening. Great house for kids, grandparents, and anyone in between! Lots of space to spead out and/or nice big table to enjoy a meal together. Great sunrises from the deck. Someone previously commented about the lack of shade? Plenty of shade! And, we left some "pool toys" which was another person's comment. We would come there again!! This is our 5th time vacationing at Osprey Point, and we just booked 3 more trips for next year. It is a wonderful house that has a vacation feel to it. The only thing I would like to ask the owners to do is put an awning over the back deck, there is no relief from the sun, other then the table umbrella, and it can get very hot and if you want a break from the sun your only choice is to go inside. We had a wonderful week at Osprey Point with our two children age 4 and 8. The house was lovely and spacious and the setting magificent, with great views and tranquility! Highly recommended for a peaceful relaxing vacation. The group at ESVR was helpful and as always made sure that we had a great vacation, over 15 stays with them. Cell phones don't always work, there isn't much to do except relax. Always a great vacation. Private yet convenient location, nice sized rooms, well furnished. We enjoyed ourselves and would definitely come back! This Oxford location is very peaceful. 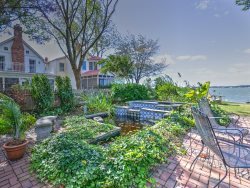 It is centrally located on the Eastern Shore to where one is about an hour from major sites like Annapolis, Ocean City, etc.... Our dog loves the area since she gets plenty of swim time. We visited for 3 nights in August 2013 and had 8 adults and a 9-month old in our group.Our family is spread on east coast from NY to NC - so this was great location for us to meet.All 4 couples loved the place, and found it exactly in the condition shown in their pictures.The Eastern Shore Vacation Rentals staff has been very helpful from our first email. Since we were arriving close to midnight, they explained their process of key acquisition in detail.During our stay, our parents got locked out of their room once and our propane grill's ignitor just won't work. One phone call to the emergency number and they jumped feet to help us as soon as they could. Very responsive staff!The house is so close to Oxford-Bellevue Ferry AND Scottish Highland Creamery is a quick walk from the house (the best local ice cream place ever).We all would like to thank everyone at Eastern Shore Vacation Rentals for the great stay. In January, we stayed at the lovely Memory Lane residence in Oxford, Md. We arrived early Saturday morning and the drive up was sunny and beautiful. When we arrived at the house, we could not believe the view--right on the water!The vacation house is comfortable, spacious, beautifully decorated, clean, and had everything that we needed for our stay. While we were there, it was quite cold outside, but we made a nice fire in the living room and warmed right up. There's a nice LCD TV in the living room as well with lots of channels. The kitchen was well-equipped as we cooked at the house for all meals. We also grilled some swordfish steaks on the grill outside. The bedrooms were extremely comfortable and relaxing. We could not believe the view from the master bedroom. It really doesn't get much better than that. Waking up to that view in the morning was priceless. There are several bathrooms, which was nice. The master bathroom has a nice large jacuzzi tub perfect for relaxing and reading a chapter from your book.All in all, we enjoyed our stay and do plan to go back to this same house next time we are in that area. The area itself is really nice and there's lots to do. We felt that every need was met and all that was left for us to do was to relax. Excellent stay, house was extremely well equiped, location was wonderful and the management co. very organized. We had a very comfortable and pleasant stay. The house was clean, the beds comfortable, and the decor lovely. We look forward to staying there again next time we visit our family in Oxford. The property was very spacious and comfortable; lots of different spaces for different types of relaxing. The kitchen was well appointed and had everything necessary to prepare a Thanksgiving feast. Great place for dogs and walks, sunrises and sunsets. The property owner and managers could not do enough to make the stay a very pleasant and enjoyable one. We had a wonderful vacation at Memory Lane! The house easily accommodated 8 people of a wide age range and the rental company was extremely easy and helpful to work with. Thank you so much for creating wonderful memories for our family vacation! Once the key situation was sorted out the rest of our stay was delightful. We found the house to be better equipped than advertised and quite comfortable. Great place. Slight insect problem which was a bummer, but other than that, we'd return. Overall excellent. Problems with a door that would. 't lock but such a safe town it didn't matter. Great location, walking to Schooners for ice cream, biking all around town, thank goodness for air conditioning in the house. It would have been helpfull to have key to garage for bikes and a hood vent that didn't vent into the kitchen. Also tp for 6 adults and 2 children would have been good. Loved the cottage; very charming and we'll maintained; want to book again for next year!! I rented the Martini Cottage as a 50 years/20 years cancer free vaca and the Cottage and ESVR was exactly everything I hoped it would be. My girlfriends and ride bikes, relaxed in the screened in porch and loved the proximity to all of Oxford. The credit at Dockside made it possible for all 4 of us to ride bikes. Staying at the Martini Cottage was wonderful! It was easy from the start, and so close to everything Oxford has to offer. We had a GREAT experience with the Martini Cottage! We were nervous to book something online without any personal references but we were delighted. One of the first things I noticed was how clean it was. We just loved the decor and coziness of the cottage and it was very quiet. The location was great - within riding distance of everything in Oxford. The one and only downfall and complaint that my husband and I had was that it didn't smell very fresh inside, it had a bit of a musty smell. Nothing some plug-ins wouldn't take care of... Other than that, it was awesome!